These borderless unnumbered postcards were produced in 1932 by the Fendrich Cigar Company of Evansville, Indiana to promote the company's Charles Denby cigar brand. The baseball players represented on the eight known cards in the set were all members of the Chicago Cubs. The issue is considered by collectors to be the last tobacco set issued before World War II. 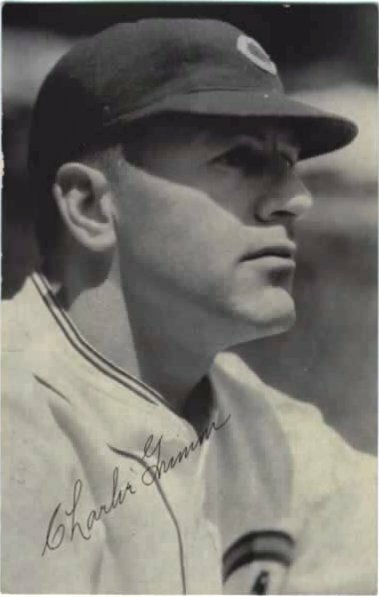 The black and white player images are high-resolution photographs labeled with only a facsimile autograph on the card front. 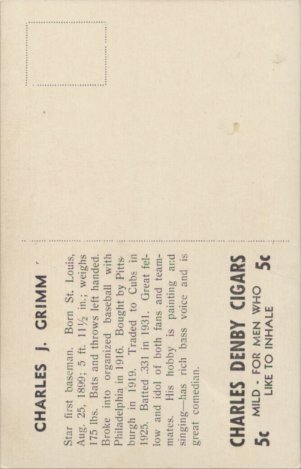 The entire message area on the postcard back, however, is filled with player data and the identification of Charles Denby Cigars as the sponsor. The 5-cent cigars were touted as "mild, for men who like to inhale." Charles Denby, the namesake for the cigar brand, was a well known diplomat in the late ninteenth century. After serving as Minister to China under U. S. Presidents Cleveland, Harrison and McKinley, he settled in Evansville, Indiana. There, he became an acquaintance of John Fendrich, president of the Fendrich Cigar Company. It was apparently Fendrich's idea to name the cigar brand after Denby, and Denby's portrait is prominently displayed inside the lid of each box (see example at left). Cigars under the Charles Denby brand continue to be manufactured today and can be purchased from the National Cigar Corporation of Frankfort, Indiana. In addition to baseball postcards, other advertizing pieces were produced and distributed by the company. An example of one such advertizing piece is the device shown below. The "hook" on the device is used to cut the tobacco stamp that seals the cigar box and to losen the brad that holds the lid closed. The "hammer" head is used to tap the brad back into its place to resecure the lid. The "handle" end of the device was used for the more familiar functions of removing the caps from beer and soda bottles. 1) How were the Denby baseball postcards distributed? One in each box? Handed out separately at point of sale? from Mastro Auction (April 2007): Each card has been assessed and encapsulated by SGC. Comfortably nestled within the upper echelon of the want lists of even the most advanced type-card hobbyists is the entry for a lone example from the Charles Denby Cigars postcard release of 1932. 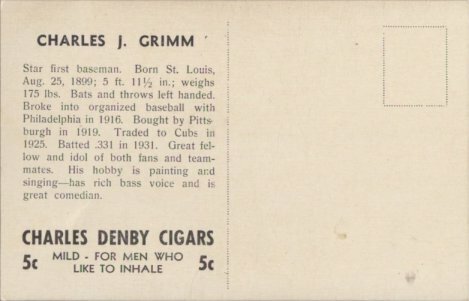 Brazenly marketed to "...MEN WHO LIKE TO INHALE" and a subject roster exclusive to the Chicago Cubs, single examples from this extremely rare, standard postcard-sized edition almost never appear at public auction. A lone specimen would be enough to take one's breath away let alone an almost unheard-of gallery of all eight subjects which currently constitutes a complete set. In addition to the "complete" status of this offering, none of the cards have been used for mail correspondence. The set includes: Assessed SGC "Authentic": 8 cards w/Hazen Cuyler, Elwood English, Charles Grimm, Williams Herman, Rogers Hornsby, William Jurges, Riggs Stephenson and Lonnie Warneke. Very few complete sets are known to exist with only a slightly larger population of miscellaneous examples available to satisfy the demand for this elusive issue. 1) Website for National Cigar Corporation, current makers of Charles Denby cigars. 2) Charles Harvey Denby Profile on Internet.